Here is where you can find out what sets the Saiyans apart from Humans. They look almost the same but have a few things that set them apart, Here you can find out about all those things that set them apart. The Tail - A Saiyans tail may seem useless but is one of the biggest advantages in their race. Although when a weak Saiyan's tail is grabbed hard they lose all of their strength but the tail can be trained/strengthened so grabbing the tail does nothing at all. But the good thing about the tail is when a Saiyan sees a full moon they transform into a giant ape. This form is called Oozaru and makes the Saiyan 10x stronger than before. The only way to get back to their regular form is to cut off the Saiyans tail or just let the moon set OR if you wanted to you could blow up the moon. When the Saiyan is in Oozaru state they will cause constant havoc unless trained to control themselves. If a Saiyan's tail is removed then there is a chance it will grow back but usually when a Saiyan has stopped growing it will not. Each time a Saiyan has a baby with another race the chance of the baby having a tail goes down. The Hair - Full blooded Saiyan hair will always retain its natural "pointy" look and a constant length, unless the Saiyan cuts his/her hair. However, a non-full blooded Saiyan will not pick up this gene. So for example if a Saiyan has a baby with a Human the baby will have hair like a Human. What I mean by that is the hair will grow and is not limited to the the Saiyan hair colour (black). Besides that they still have that pointy look Saiyans do. If a Saiyan goes Super Saiyan their hair will go into a pointy state but when they power down, back to their normal state the hair will go back to how he/she had it. As you can see from the picture on the left Goku's hair changed only very slightly from the picture above it. This is because a different artist probably drew it. You may also think Goku's hair was bigger in the picture above but this is only because he "grew" into his hair so it appears slightly smaller when he is older. Recovery - Most people know about the Saiyan's ability to gain great strength after being beaten up, but it is not ability unique to Saiyan's. Humans even possess this ability. When you lift weights for example, you are actually breaking the muscle fibers, which are then rebuilt bigger and stronger. The Saiyan's ability however seems to be much more potent, as they gain great strength from any beating, this accounts for why the Saiyan's power levels rise so much compared to the Namekians and Humans. Again this is also a genetic trait, it occurs in almost all life forms, and even the hybrid Saiyans acquire this skill, so it must be a dominant Saiyan gene. Overall the Saiyans are very genetically similar to humans, but after generations of fighting, and working for Frieza especially, has bred a very strong, proud race. Accentuating the already present unique Saiyan genetic characteristics. Fighting - is a big part of the Saiyan race. They LOVE it. They will spend their entire lives trying to become stronger and trying to be the strongest in the universe. The Saiyans planet is 10x that of Earth's which gives them a nice home planet to train on. Fighting is in the Saiyan's blood, it's part of who they are; their race. Frieza knew this and enslaved the Saiyan race making them takeover planets and selling them off to the highest bidder. Eventually the Saiyans become too strong and Frieza was scared at how much stronger they may become. Frieza then destroyed the entire planet with a single attack. Only Goku, Vegeta, Nappa, Broly, Paragas, Turles and Raditz survived. Goku, who happened to be a "low class" Saiyan so he was sent to a planet that he could conquer, but when Goku was a baby he was dropped on his head thus Goku lost all that info in his brain to destroy all life. A genetic characteristic, which is buried deep within every Saiyan. Saiyan's transformations are triggered by extreme emotion. Like when we cry, tear ducts are activated by hormones sent by the brain. Same for the Saiyans, when they experience extreme emotion their brain sends a chemical message to "turn on" the Super Saiyan gene. The transformation only occurs however when the power level is high enough. Once the first transformation has happened the Saiyan can learn to make the transformation without extreme emotion. Just like actors can make themselves cry, without being upset. The Super Saiyan gene appears to be a very dominant gene, as even the 1/16 Saiyan, Goku Jr could go SSJ. But if the child is conceived before the parent goes SSJ, they will have to turn on their gene in the normal way. 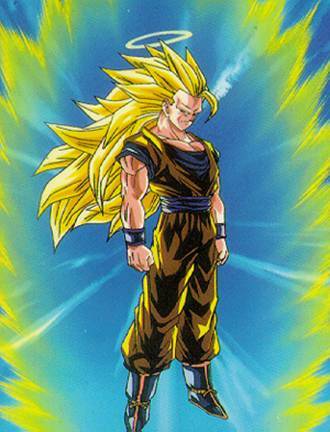 If the Saiyan has already gone SSJ it causes a change in the DNA that allows the Saiyan to go SSJ much easier.